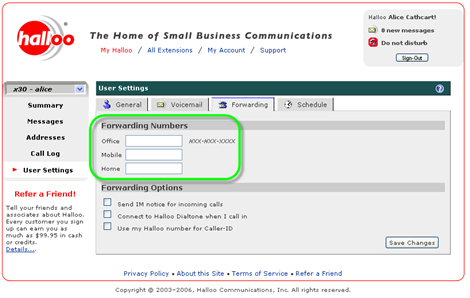 Halloo - How do I control whether callers reach my cellphone or Halloo voicemail? How do I control whether callers reach my cellphone or Halloo voicemail? You control whether your cell phone’s voicemail picks up first or Halloo picks up, by configuring the “Rings” parameter in your User Settings tab. Go to the User Settings tab, and the Voicemail. Scroll down to the “Voicemail Options” section, and select the number of rings you would like before the Halloo voicemail picks up. Each ring lasts 6 seconds. If the number of rings you select results in a longer delay than your cell phone voicemail waits to pick up, your cell phone voicemail will pick up first. If the number of rings is small enough that the delay is shorter than your cell phone’s, your Halloo voicemail will pick up. Even with a small number of rings selected, you may find that your cell phone voicemail picks up first when you are out of range, on the phone, or your cell phone is turned off. If there is any chance of this, please be sure to check your messages on both your cellular service and Halloo.